Can Ten Seconds Change Minds? 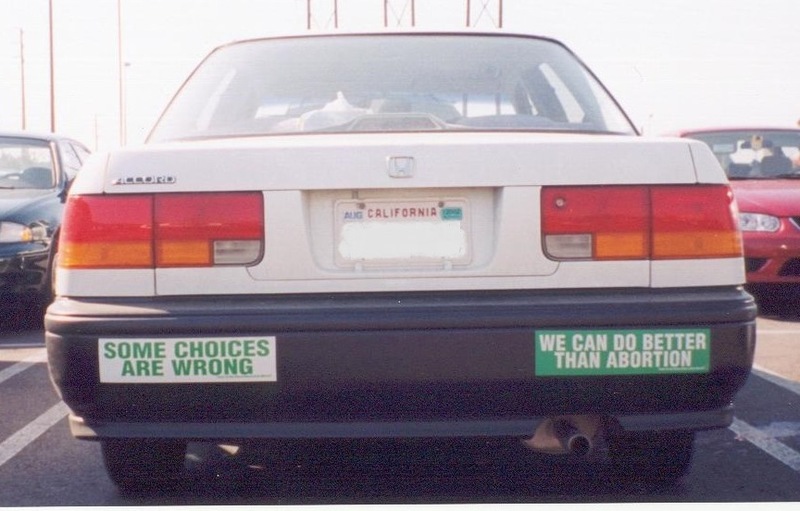 This post is not about changing minds with bumper stickers, as worthwhile as that might be. Read the post and my July newsletter, and you’ll see what I mean! It all started at 1:40 AM at a stoplight on Pacific Coast Highway in Hermosa Beach, California. My July newsletter tells what happened there and how one good thing that came of it was a sound bite that is still making an impact on how people think about abortion 13 years later. The short letter, Ten Seconds Can Change Minds, includes stories of real conversations from JFA trainers Jeremy Gorr and CK Wisner. To read the letter, click the link above or either of the pictures in this post. See more of the conversation with the women at the stoplight in an excerpt from my original write-up on the incident (a one-page reduction of my August 2002 newsletter): Got Ten Seconds? Admittedly, there are some limitations to the “10-Second Pro-Life Apologist.” Even though it has a logical structure similar to a syllogism, it shouldn’t be expressed by pro-lifers as an air-tight argument to which no responses can be made. I use the “10-Second Pro-Life Apologist” instead in the same way a soccer team uses a kick-off. The sound bite just gets things started. It helps me to put something on the table and then shut my mouth to allow the other person to talk, to respond, to think with me. In this sense, it is purposefully incomplete. It invites questions. So, I suggest to pro-life advocates to take care in the amount of weight they give to these three sentences, expressed on their own, without clarification. In other words, don’t toss the “10-Second Pro-Life Apologist” out there as if just in saying these three sentences, it should silence all debate. No, on the contrary, it is meant simply to get productive dialogue started. One of the main limitations is the fact that these three sentences only implicitly make reference to the fact that the unborn is a whole organism. In my view, this is an essential clarification pro-life advocates must make in their conversations about the unborn. So, the unborn is not just living (like any cells or tissue of any species) and is not just human (like HeLa cells) but it is a special sort of living, human tissue that is integrated and organized in a specific way – the same way that you and I are integrated and organized, as a whole organism. To illustrate the above point, note, for example, the way in which PZ Meyers misunderstood the intended purpose in using a version of the “10-Second Pro-Life Apologist” by Kristan Hawkins, the President of SFLA; note also the detailed critique of the PZ Meyers piece by Clinton Wilcox. Exercise 3 in JFA’s Interactive Guide teaches you to use the “10-Second Pro-Life Apologist” in conversation. You can see how I would clarify the “organism” point (see Note #1 above) in the “Imitate” section of Exercise 3. Get the Interactive Guide here. If you’ve enrolled in our “Learn at Home” program by completing the exercises at www.jfaweb.org/learn-at-home, the “10-Second Pro-Life Apologist” should look familiar to you. It comprises the first ten seconds of the one-minute sound bite featured in Step 2. The 10-Second Pro-Life Apologist has been referenced and utilized by many pro-life advocates and organizations, including SFLA, Trent Horn, Amy Hall, Brett Kunkle, and Josh Brahm. Has the “10-Second Pro-Life Apologist” helped you in your conversations about abortion? Share your story in the comments below.